Self-service check-in: It will be important campers have their registration form printed and know their campsite before arriving. This will help you find your site and ensure you have proof of booking for when the staff patrol the campground. A crackling campfire for roasting and toasting. If you’re arriving after dark, it can be challenging to familiarize yourself with the park and find your site. Try to plan arrival for before sunset. Luckily, if you’re glamping with us, we’ll have your bell tent and equipment all set-up, your beds made and ready for your arrival! We can even have your wood waiting for you to spark your fire! Check the park’s online map beforehand, print it, bring it, and know where you’re going before you arrive. Cosy for a family of five. 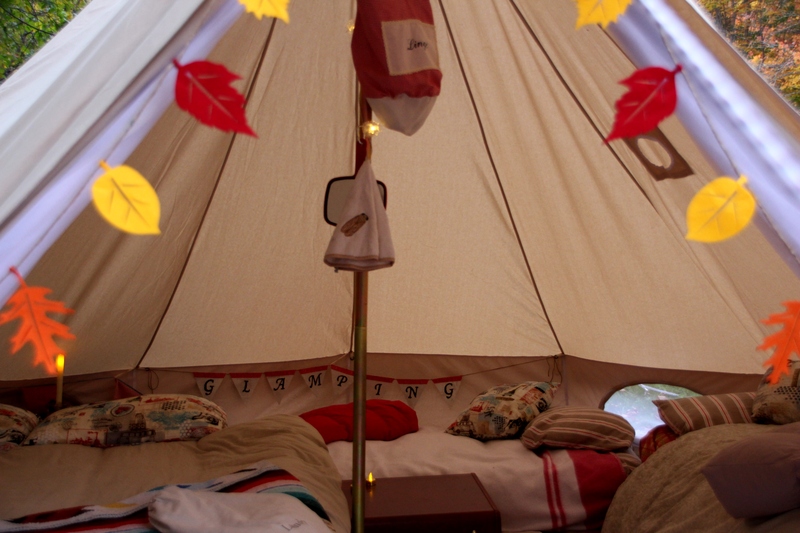 East Coast Glamping in a bell tent in Oct. 2014. Will the self-service parks be patrolled at night to help support park curfew and camper security? “Security is important for our campers,” says Sarah Levy MacLeod, spokesperson for Department of Natural Resources. DNR says both maintenance staff and Conservation Officers will be in the park throughout the day and evenings as required. Typically, MacLeod says the provincial parks are not patrolled overnight, even before the move to self-service. How will campers get firewood? DNR says ‘How-To’ info will be released before the 2015 season launches. At some Canadian parks, like Banff National Park, firewood is available free to campers, but campers must purchase a fire permit ahead. 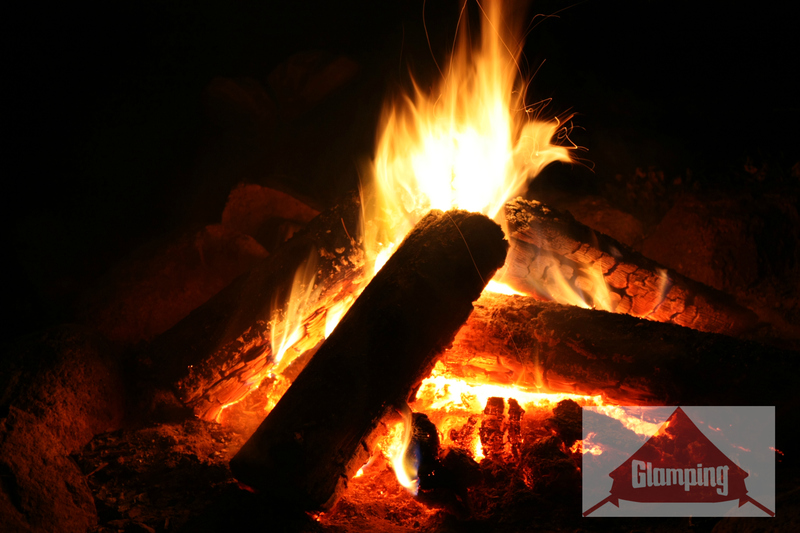 In Nova Scotia, campers are not allowed to bring wood from outside the campground and must use wood supplied on site. What happens if you pre-book a site and upon arrival want to change? How will campers easily move? “We will have self-serve phones installed for all affected parks by the start of the 2015 camping season to make on site registration and potential changes possible,” says MacLeod. Other Canadian provinces, like Alberta, have self-service campgrounds in operation. If you arrive to your site and find it’s not what you were looking for, you can switch provided the site is available, by checking at a Contact Station. “It is important to us to minimize the impact to visitors and campers – and this will be top of mind as we work through these details,” says MacLeod. 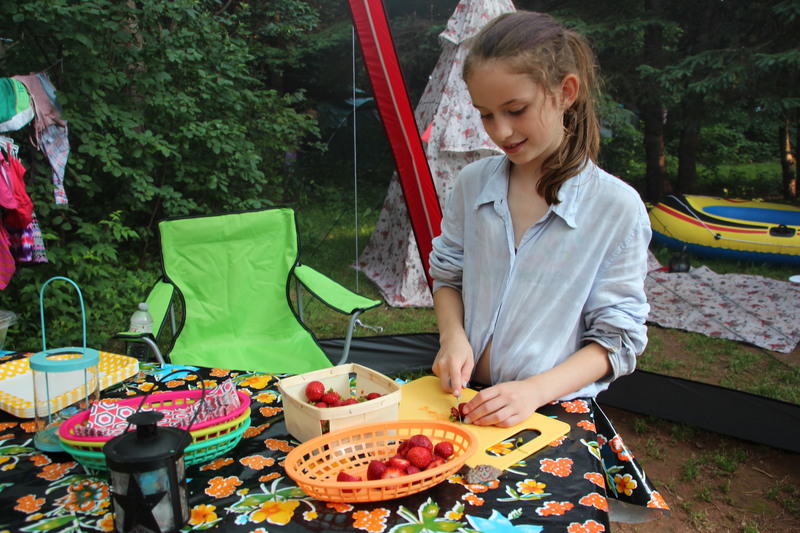 Preparing the strawberries for fluff-roasted strawberry s’mores. Security: How will the change to self-service affect campers security? Individual campsite security has always been the responsibility of the camper. However, DNR says staff will be in the park daily, and the area will continue being patrolled by Conservation Officers. When we’re glamping, we keep our valuables locked securely in our vehicle – and if we don’t need it – we leave it at home. Thanksgiving at Whycocomagh Provincial Park. Despite cost savings and stream-lining, not everyone agrees taking the people out of the park is a positive move. Joan Jessome, president of Nova Scotia Government and General Employees Union (NSGEU/NUPGE) says, taking the people out of the parks is a hit to Nova Scotian hospitality and friendliness. Front-line staff at parks … provide important services that include convincing visitors to try new things and extend their stay in our province—word-of-mouth information and experience that cannot be replaced by machines or the Internet. ‘Most campers will not notice a difference, beyond paying at pay stations instead of paying park staff. 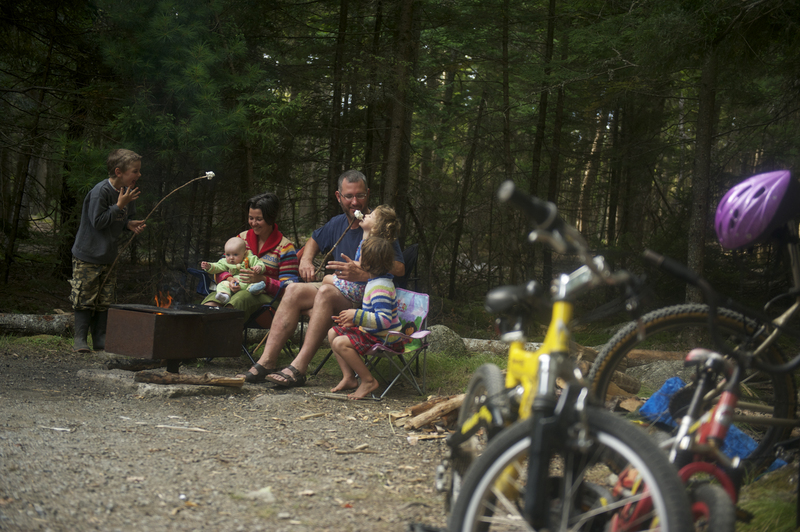 Self-service campgrounds are becoming more common in other provinces,’ news release statement. 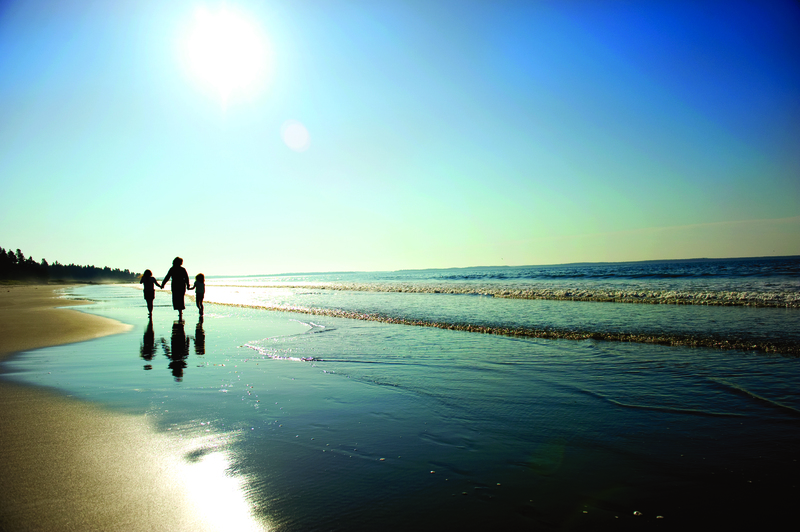 Nova Scotia’s provincial parks are a quintessential way to experience authentic maritime Canadian camping. We’ll be sharing plenty of camping tips on our blog. Please follow along and share your experiences. We’d love to hear from you! We’re not about roughing’ it. Get lost in a Nova Scotia Provincial Park this summer — and find beautiful. Perhaps they’re in the woods along MacIntosh Trail? Twice around the bog to be sure. Once at mid-day and then again at dusk on our way back to camp. Prepping dinner with Corona’s in hand. 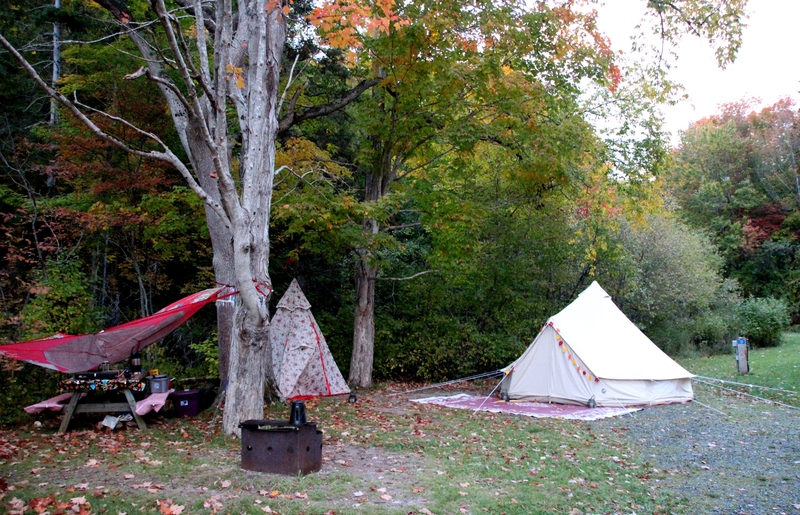 Want to try a little East Coast Glamping this summer? Our expert team will ensure you find your perfect campsite and every glamping detail is facilitated. Our bell tents are available to rent or buy and after renting, if you find you love it — we’ll take the cost of the base rental off the purchase price. NOTE: Since published, a fellow glamper got in touch and asked us about the Family Programming at the parks and how it will be affected at self-service parks, like Smileys Provincial Park. Unfortunately there isn’t any information available on this at the moment, according to Parks Nova Scotia. However they say their website is currently up-to-date and they suggest contacted the parks directly for information on the family programming, once the parks open. Here’s a link specifically for making reservations at Self-Service Campgrounds. Note that debit cards won’t be accepted for those registering at the park without a reservation. Alternatively, you can inquire on the reservations line once it opens on Apr. 2, 2015. Cheers and thanks for connecting!